File photo: Activists hold a rally in honour of late Gani Fawehinmi in Lagos in September 2016. 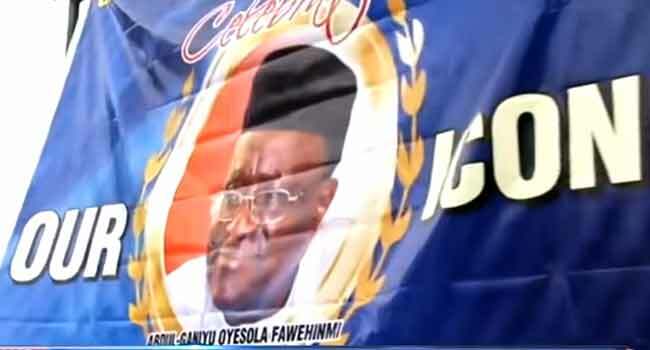 The family of late respected human and civil rights lawyer, Gani Fawehinmi, has revealed why they will accept the national honour conferred on the activist by the Federal Government. Mr Mohammed, a lawyer and son of late Fawehinmi, explained the rationale behind the family’s decision on Thursday during a telephone interview with Channels Television. “We are definitely going to accept this award,” he said on Politics Today. President Muhammadu Buhari had on Wednesday conferred a posthumous national award of Grand Commander of the Order of Niger (GCON) on Fawehinmi, as well as a posthumous honour of Grand Commander of the Federal Republic (GCFR) on MKO Abiola. He had also declared June 12 as Nigeria’s new Democracy Day, in honour of Abiola who was presumed to have won the 1993 Presidential Election. Fawehinmi’s son, in his reaction, commended the development which he said his father fought to achieve until his last breath in September 2009. He added that when the news of the recognition got to the family, they received it with great joy, knowing that their agitation was finally addressed by the government. Mohammed, who faulted allegations that the June 12 declaration was for political gains, reacted to the controversy triggered by the legality of the President’s decision. He noted that the declaration ought to have been made since 1999, insisting that it was the right thing to do for any government. Fawehinmi said, “It’s absolutely right. This was what former President Olusegun Obasanjo should have done in 1999 when everybody went to beg him. There’s no basis for May 29 existing (as Democracy Day). “I have one belief, there is never a bad time to do something good. We were denied the opportunity of MKO leading us on June 12, 1993, and it is best that we set the record straight, which is what President Buhari has done now. “We continued to agitate and happily 25 years on, we have achieved our aim,” he added.